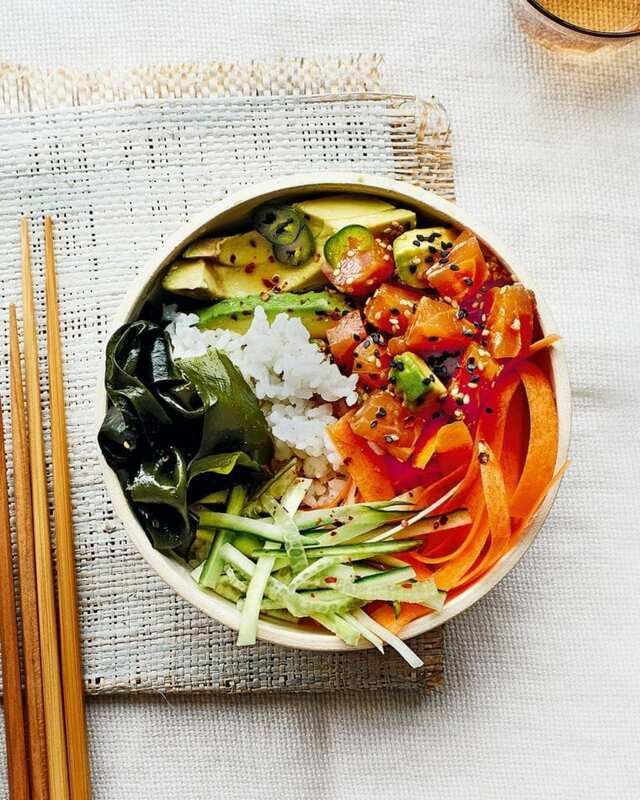 A poke bowl is one of the best ways to showcase raw fish. We’ve topped rice with avocado, crunchy veg, seaweed and marinated salmon, creating a fresh dish that’ll bowl your guests over. Soak the rice in cold water for 5 minutes, then rinse twice to remove any excess starch. Put in a saucepan with a lid, add 350ml water and bring to the boil. When boiling, cover with the lid and turn down the heat to very low. Cook for 15 minutes, then remove from the heat. Meanwhile, for the dressing, toast the sesame seeds in a dry pan until fragrant. Put in a bowl with the soy sauce, sesame oil, vinegar, lemon juice and chilli. Chop the salmon into 1cm cubes and toss into the dressing with the cubed avocado. Finely slice the cucumber and shave the carrot into thin strips using a Y-shaped vegetable peeler. Remove the lid from the rice. Sprinkle with the 2 tbsp rice vinegar, fluff with a fork, then spoon into deep bowls. Top with the cucumber, carrot, sliced avocado and arame (if using), then the salmon and avocado mixture, giving each its own space on top of the rice. Scatter with chilli flakes if you like. Use any of your favourite vegetables in this poke bowl. We like edamame beans, sliced radish and mango, too. A New Zealand sauvignon blanc has the bright fruitiness to take on the fish and green chilli here. The rant: Why do we send so much of our seafood abroad?